New York City, other than being the city that never sleeps is also an excellent vacation destination. If you’re considering a New York Vacation but worried about the selection or availability of great family activities in which to participate, let me put your mind to rest. There are many family activities in New York City that will appeal to all ages from toddlers to teens. Some of these great activities are surprisingly easy on the pocketbook despite New York City’s reputation for being an expensive place to live and/or visit. There are many ways the careful planner can enjoy many of this great cities attractions for little or no cost. Most museums offer free admission one night or day each week. Check around and plan your trip to that particular museum on the free days and evenings. Additionally, several of the museums offer a ‘pay what you wish’ policy, which allows you to offer a donation for entrance rather than having a set price that would exclude many from visiting. Visiting museums are a great way for everyone in your family to gain some cultural insight from their New York City visit while the free nights make this experience rather easy on the pocketbook. In addition to these museums you can also take a stroll down the boardwalk of Coney Island. 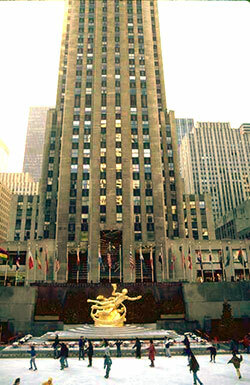 In the winter, try ice-skating in Rockefeller Center. If you have the time and inclination Queens County Farm Museum offers free admission (with the exception of special events so be sure to check) and provides the family with a step back in time. For a truly historical experience visit Federal Hall National Memorial. Admission is free and you will be able to view American History at its core. This is the place where George Washington took the oath of office and our form of democracy was born. For any American history buff or school aged child this is one of the must see freebies available in New York City. Other national parks in New York City that are of interest historically include Ellis Isle, the Statue of Liberty, Grant’s Tomb, and Fort Wadsworth. Each of these parks offer free admission to the general public and make a great place for the entire family to not only visit and enjoy but also to learn about our history. Wave Hill is another great place to visit. This tour is free during the week otherwise is it $10 for adults and $4 for children. Regardless of whether you go during the week or on the weekend it is still an excellent value for the price of your visit. Of course this is only a small sample of the many free and low priced things to do in this great city. You will definitely want to wear comfortable walking shoes for the many miles your feet will take you in this fascinating city. In addition to the many family activities mentioned above, New York City is home to some of the world’s finest parks, which also offer free recreational and cultural experiences to their visitors. I highly recommend that you pay careful attention to try and plan activities that are free and activities that cost little money with those other can’t miss activities in similar areas. This will save time (a very big commodity when traveling around New York City) and the money you would pay in transportation fees. Planning your trip ahead of time is one of the most economical decisions you can make. This doesn’t mean that you can’t be flexible if you see something when you get there, just that you have a pretty good idea of the things you really want to do balanced with the reality of the budget with which you have to do them all. The most important thing to do is have fun!